Why grandma doesn’t leave the penny slots…. One of the best lessons or metaphors about behavior is the slot machine. We use this example all the time to teach lessons about strengthening behavior. In the world of my profession, we measure the strength of a behavior by how hard it is to get rid of it when the benefit of the behavior does not occur (e.g., how many times will you push the Coke machine button without getting the Coke). 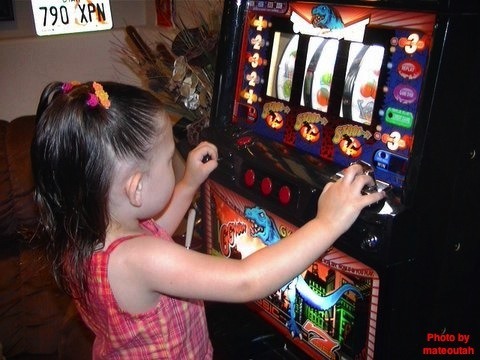 What better example than the behavior of playing a slot machine? People sit for hours on end on these machines, NOT winning, and in many cases LOSING. Behaviors reinforced every now and then are harder to get rid of than behaviors that are reinforced every time. Sounds weird, right? Well, slot machines take full advantage of this. How many times will you continue to pull that lever without getting paid? Much longer at a machine that pays every now-and-then when compared to one that pays every time. If you got paid every time you sat at a slot machine and all of a sudden it stopped paying you, you would leave much quicker than you would if you went to Vegas today and sat down to play the slot machine that has been programmed to pay just enough to keep you there. That’s not my opinion…that’s just how behavior works. How many times do you continue putting money into the Coke machine after it has “eaten” your money?…exactly. When talking to parents about a certain challenging behavior they are dealing with, I wonder how often the kid is getting the benefit from the behavior. I don’t wonder if it happens every time, I’m just wondering if it is happening just enough to keep the behavior strong. If I’m talking to the parent about the behavior that is still driving them crazy, the proof is in the pudding (slung all over the wall after the last tantrum). This is especially true when the “pay out” occurs after longer and more intense behaviors/ arguments/ whining. Think about a tantrum that lasts so long you finally give up and do something to satisfy the tantrum. That’s the equivalent of paying out after 100 lever pulls. Whoops. How long your child “pulls the lever” (insert problem behavior here) depends on your consistency. Tantrums are going to happen, your kid is going to refuse to do something, he’s going to yell when you say, “quiet.” The question is, do those behaviors work more often than they don’t? When at first they don’t succeed, do they keep going? Do they amp it up if that doesn’t work? Perfection is not likely or necessary (thank goodness). I’m simply asking you to just pay attention to these things, be mindful of the “slot machine” effect, and have a plan. This entry was posted in Uncategorized and tagged consistency, prevention, reinforcement by BehaviorBandAid. Bookmark the permalink.